Apple TV 4th generation ("ATV4") is the latest generation of audio and video streamer from Apple Inc. New to generation 4 is inbuilt Dolby® decoding for multichannel audio. 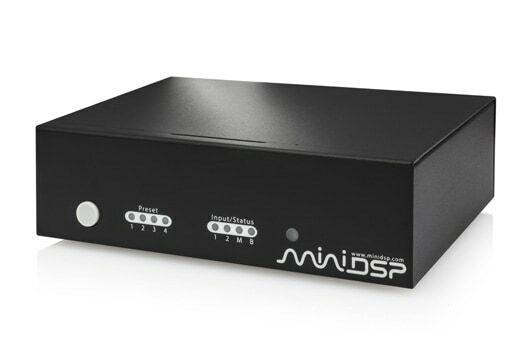 This new feature means that it is now possible to connect it directly to the nanoAVR DL, miniDSP's tiny audio processor with Dirac Live®, the world's premiere room correction system. The diagram below illustrates how to set up the Apple TV together with the nanoAVR DL. Just connect the HDMI output of the ATV4 to one of the HDMI inputs of the nanoAVR DL. (You can connect another source like a Blu-ray player to the second input of the nanoAVR DL, provided that the source generates multichannel linear PCM.) The output from the nanoAVR DL connects to an HDMI input on your receiver. Now you can set up the nanoAVR DL as described in our comprehensive User Manual. When you are done, all audio from the Apple TV will have Dirac Live® room correction applied to it! That's it for this app note! Have fun, and please let us know about your Apple TV and miniDSP experience in our forum.